This second report is the culmination of many months of rigorous and independent investigation, working closely with the organisations involved in the incident, as well as relevant organisations, and subject matter experts. A series of different methodologies were used which included: review of records, policies and procedures, and practice relating to transitioning of young people into adult services, and the identification of the needs of individual young people and the response to those needs. 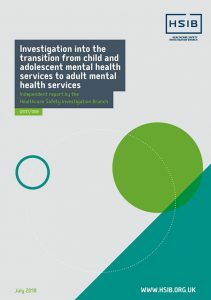 A focus group involving up to 14 young people who had either transitioned from CAMHS to AMHS or were in the process of transitioning provided the investigation with a lived experience of the issues and concerns for young people and where services were not meeting their needs.